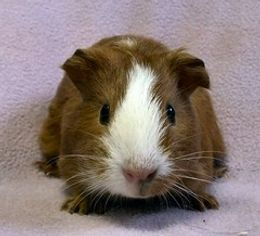 Guinea pigs should be given plenty of floor time to get exercise, given toys to prevent boredom and given things to chew on to maintain healthy teeth. 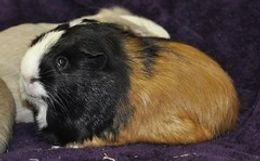 DO NOT USE EXERCISE WHEELS OR EXERCISE BALLS, as these can cause crippling back injuries to a guinea pig. They may be shy at first, but with gentle handling your guinea pigs will come to enjoy interacting with you and your family, and look forward to your visits to see and talk to them! Place a plastic shower curtain on the floor with a soft blanket on top for traction and comfort. Loosely connect about 17 cube grids with zip-ties. You don’t want to zip tie it too tight, as you want to be able to fold it away for storage. The end pieces overlap and can be bulldog clipped together for use and then folded away for easy storage. Make a litter-box / hay box by lining a low-sided plastic bin with newspaper, then fill it with hay and place along the wall of the playpen. Hook a water bottle onto the grid near it. 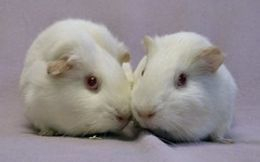 The optimum temperature for guinea pigs is 68° - 72° with humidity of 45 - 65%. Guinea pigs cannot sweat and will die from heatstroke if the temperature is in excess of 80°, or even 75° with the humidity above 50%. Be sure that your guinea pigs are contained in an enclosed area or playpen in the shade. Don't forget to hang a water bottle for them - playing is hard work! You must stay with them the whole time and watch for dogs, hawks, snakes and other predators. You must also make sure that your grass has not been treated with any pesticides or fertilizers, all of which are toxic to guinea pigs. Natural dandelion greens are a favorite guinea pig snack, and a fun way to weed your lawn. Here is a link to a list of common forages for guinea pigs.